Lemongrass leaves? Strange though we discard them over here and only use the end white part. Then again, maybe we are behind time, sure, these leaves I can see did aplenty justice to this herbal ice. I would love to sip in. When I was living in Ireland, I saw only lemongrass stalks! But, these leaves are just as much flavorful if not more. Try it once to see the results. Cheers! Have a huge pot of lemon grass in my garden; your simple but absolutely healthy tea is tempting me to rush to my garden to make this; superb! Try it Vanitha. I am very sure you will like it. Wish i get this drink rite now, simply irresistible and definitely a fabulous thirsty quencher. Lovely clicks there. Lovely .. Love that awesome colour and beautiful clicks do full justice to the tea.. Is that lovely colour from Lemon grass ? Sharmila - the colour is from the tea itself. Lemon grass extract doesn't really have a colour. Ice tea looks so refreshing and adding the lemongrass leaves takes it to another level...I just want to grab the glass off screen!! Ginger being my favourite I welcome this drink with two hands! I bet It must be aromatic and tasted delicious :) can't wait for the summer here. Looks refreshing and beautiful. Loved your ingredients and easy method. Love to try this soon! Wow... Even I used to discard the leaves and use only the stem part. Thanks for sharing. Will try this one. What herbal extract did you use? This herbal tea looks so inviting!! Perfect for approaching summers. I too hoard a lot of books and half my stack is cookbooks! I am not a tea person but sometimes I like to experiment with iced tea varieties. I have dried lemon grass with me.The fresh ones are not available here. 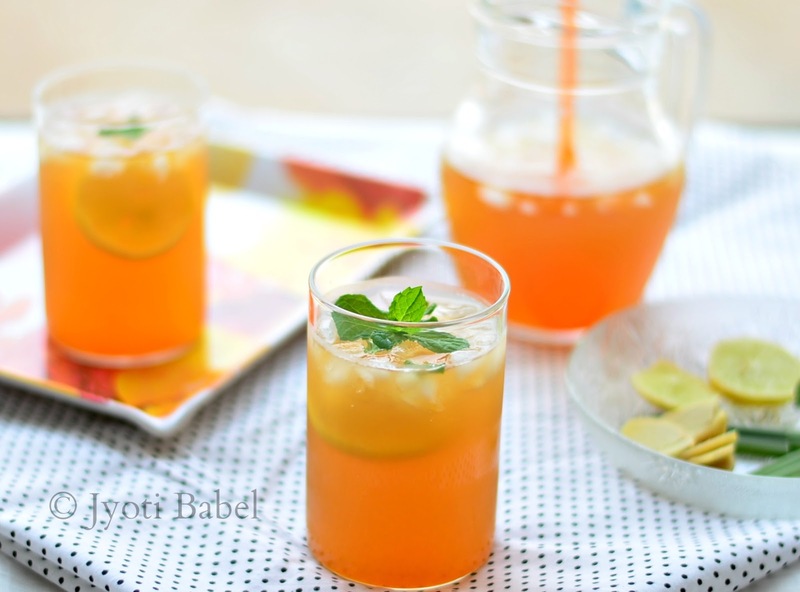 Am wondering if it would be possible to use that to make this tea coz the tea looks so refreshing and cool, something we need to beat this heat! 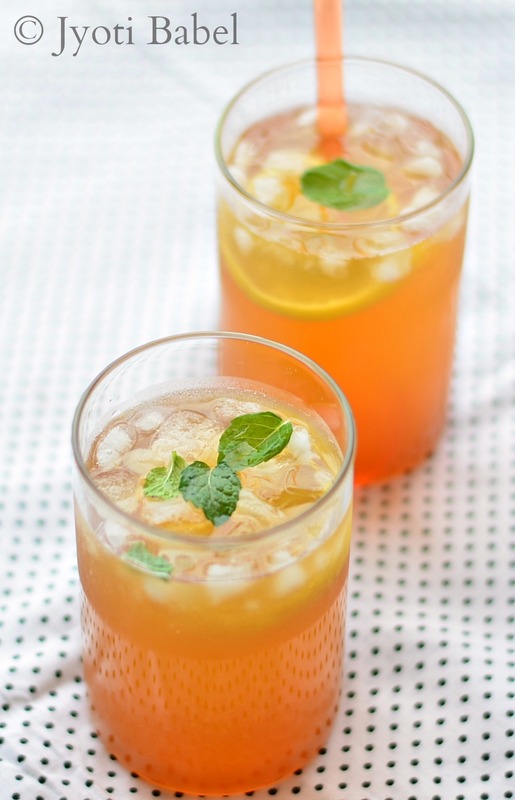 Such an awesome thrist-quenching summer drink. Such a refreshing herbal iced tea. 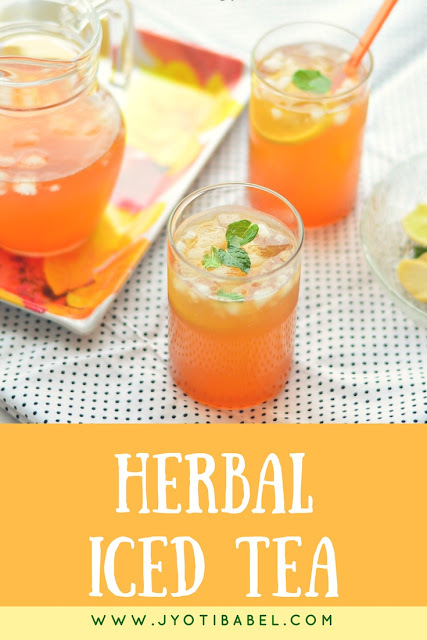 I love the iced tea in summers but never tried with herbal tea. The lemon grass leaves much more flavorful. Refreshing Iced Tea.. Sure the herbal mix smells great.. and I love the idea of adding the Herbal ice cubes in lemonade..
Love it as it has lemon grass. Trying to grow my batch of lemon grass. Will save up the recipe for the quick use. Hoarder of cookbooks .. hmm sounds just like me. Honestly I made more dishes from the cookbooks prior to blogging but haven't really done much in recent times and your post reminds me that I should really do something about it. Iced teas are my fav and I prefer homemade ones just like you. You can control the sugar too that way. Great share, gorgeous colour and amazing pics. 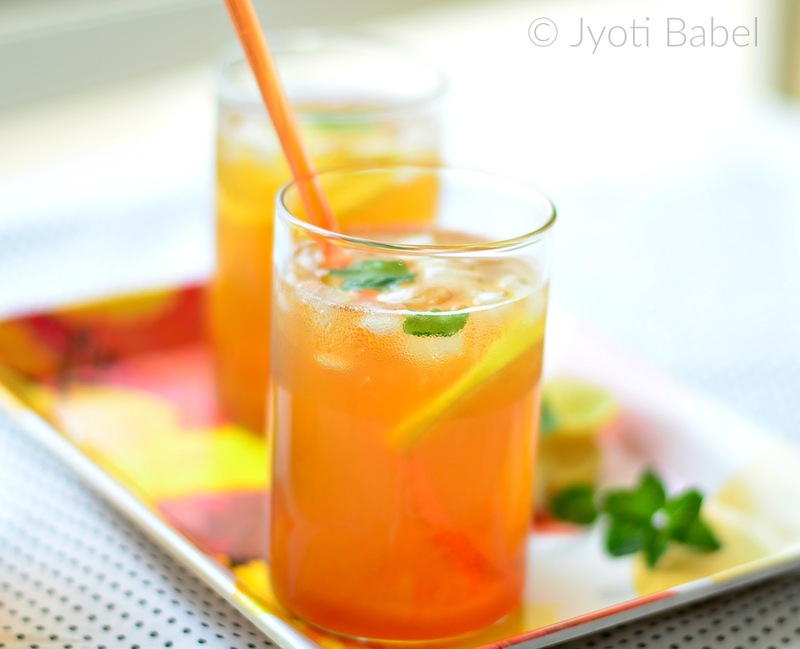 I love these iced tea in summer, they are such a relief. This one looks good, thanks for sharing. Beautiful picture and it is so inviting. Bookmarking it for future use.